La Scala (UK: /læ ˈskɑːlə/, US: /lɑː -/, Italian: [la ˈskaːla]; abbreviation in Italian language for the official name Teatro alla Scala [teˈaːtro alla ˈskaːla]) is an opera house in Milan, Italy. 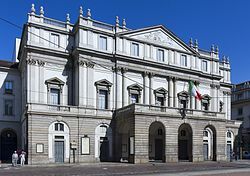 The theatre was inaugurated on 3 August 1778 and was originally known as the Nuovo Regio Ducale Teatro alla Scala (New Royal-Ducal Theatre alla Scala). The premiere performance was Antonio Salieri's Europa riconosciuta. Above the boxes, La Scala has a gallery—called the loggione—where the less wealthy can watch the performances. The gallery is typically crowded with the most critical opera aficionados, known as the loggionisti, who can be ecstatic or merciless towards singers' perceived successes or failures. For their failures, artists receive a "baptism of fire" from these aficionados, and fiascos are long remembered. For example, in 2006, tenor Roberto Alagna was booed off the stage during a performance of Aida. This forced his understudy, Antonello Palombi, to quickly replace him mid-scene without time to change into a costume. La Scala hosted the first productions of many famous operas, and had a special relationship with Verdi. For several years, however, Verdi did not allow his work to be played here, as some of his music had been modified (he said "corrupted") by the orchestra. This dispute originated in a disagreement over the production of his Giovanna d'Arco in 1845; however the composer later conducted his Requiem there on 25 May 1874 and he announced in 1886 that La Scala would host the premiere of what was to become his penultimate opera, Otello. The premiere of his last opera, Falstaff was also given in the theatre. The opera house re-opened on 7 December 2004 with a production, conducted by Riccardo Muti, of Salieri's Europa riconosciuta, the opera performed at La Scala's inauguration in 1778. Tickets for the re-opening fetched up to €2,000. The renovations cost a reported €61 million, and left a budget shortfall that the opera house overcame in 2006. In May 2005, Stéphane Lissner, formerly head of the Aix-en-Provence Festival, was appointed General Manager and Artistic Director of La Scala, becoming the first non-Italian in its history to hold the office. On 15 May 2006, Daniel Barenboim was named Maestro Scaligero, or de facto principal guest conductor, of the company. In October 2011, Barenboim was appointed the next music director of La Scala, effective December 2011, with an initial contract of 5 years. In December 2013, management named Riccardo Chailly the next music director of La Scala, effective 1 January 2015. Stéphane Lissner left La Scala for the Paris Opera. His successor Alexander Pereira [de], formerly director of the Salzburg Festival, began his tenure on 1 October 2014. La Scala will host the opening ceremony of the 134th IOC Session in 2019. ^ "La Scala" (US) and "La Scala". Oxford Dictionaries. Oxford University Press. Retrieved January 20, 2019. ^ "La Scala revamp finished early". CBC News. 5 November 2004. ^ a b "La Scala board fires top official". BBC News. 25 February 2005. ^ "Barenboim to head La Scala". Gramophone. London. 14 October 2011. Retrieved 15 October 2011. ^ It's official: Riccardo Chailly to be La Scala's new music director, Gramophone (London). 10 December 2013. ^ "Alexander Pereira to Begin La Scala Tenure in October 2014, Year Earlier Than Originally Announced". Opera News. 19 July 2013. Retrieved 7 October 2013. ^ "IOC Elects Milan as Host of the IOC Session in 2019" (Press release). International Olympic Committee. 15 September 2017. Retrieved 21 February 2019. ^ Cantelli died in an airplane crash one week after his appointment. Wikimedia Commons has media related to Teatro alla Scala. This page was last edited on 21 February 2019, at 07:44 (UTC).